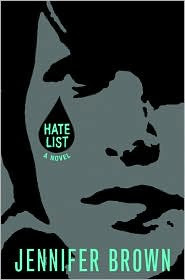 Hate List follows the life of Valerie Leftman after her Boyfriend, Nick, takes revenge on students that had picked on him or Valerie in the past. The names of the students that Nick is looking can be found in the HATE LIST book--which is a notebook filled of things/people that Nick and Valerie, hate. Valerie had no idea that the Hate List would ever be used for that and is left to piece her life back together when the whole town seems to want revenge on her--as she was also the one who wrote in the Hate List. Brown has weaved an amazing tale that has been seen in the media before. Teens filled with so much hate--usually caused by bullying, they turn on their peers and teachers. Leaving the rest of the town in shambles while looking for someone to blame. Few books make me shed a tear--but this book is filled with strong emotions. You feel sorry for everyone in the book at the end of the story--or at least I did. I would highly recommend this book to anyone--it's wonderfully written and fills you in on every aspect of the story regardless if it's from the past or present.